I’m trying to figure out the best approach to this. Basically I have line series which is defining a limit, may only have points at X=0 & max rather than individual points. My 2nd value I want to fill with one color when it’s below that limit and if it goes above the limit then only the portion above that limit should be colored differently (blue in example). Anybody able to set me on the right track for this? I can think of ways to do it if I break the 2nd value up and display as two series (would basically be a stacked mountain then. and just limit one to not go above the limit value. Is there a way to avoid breaking this up to separate series and just style it? If you change the logarithmic Y axis to a regular NumericalAxis, the mountain series displays properly (with fill color). I’m following the example from “How to position columns between data values instead of centered on data”. If I use automatic tick on X axis, it adds labels but not on all column line separators (even after setting he IsLabelCullingEnabled to false). The only way I can get the labels on all separator column ticks is by playing with the MinorDelta and MajorDelta. The problem with this is that the X values have to be evenly spaced in order to work. If I have the X values: 10, 20, 30, 45, 50 the lines will be added, but ticks will be drawn by the X Axis so they won’t match. Can you advice on how to implement a custom tick drawer that sets the ticks based on the lines drawn? Is there any method to paint FastMountainRenderableSeries and FastBandRenderableSeries with texture (e.g. bmp image)? Here is image below for example. I have a mountain chart in which I have flipped the Y-Axis in order to plot a descending depth below sea surface. When I flip the axis the area color gets filled in in the top part of the mountain chart which for the sake of plotting a descending depth visually looks a bit off. 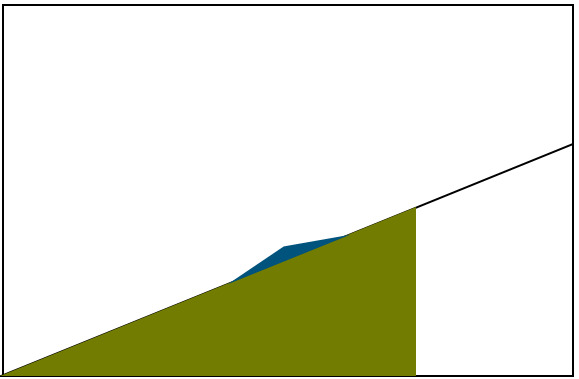 Is there any way to keep the area color fill in the lower part of the mountain series even with the Y axis flipped ? I think I found a bug. I tried to make example as simple as possible (see attached project). Exception (Object must be of type of the type of series) is thrown if I select the series line (1) and then clicking few times on the area of the graph (2). It seems to be more sensitive in the area “under” the graph. It seems that it happens only if I use SeriesSelectionModifier. FastMountainRenderableSeries seems to be more sensitive to this error than LineRenderableSeries. I’m working with painting FastMountainRenderableSeries. Now I need to give to user an ability to paint curve not only under the line, but above line too. Is there any automatic property to make it?